Numismatic Errors: Error Showcase: Lincoln Memorial Cent Brockage or Planchet Split after Strike? Error Showcase: Lincoln Memorial Cent Brockage or Planchet Split after Strike? At first glance this Lincoln cent appears to be a brockage (struck by capped die) error but the physical evidence points to a condition known as planchet split after strike. The reverse "tails" side of the coin has a normal memorial design. 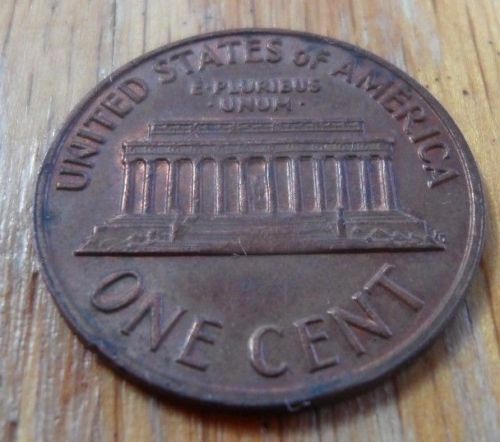 The obverse "heads" side has a blurred mirror image of the reverse design instead of the proper obverse design. 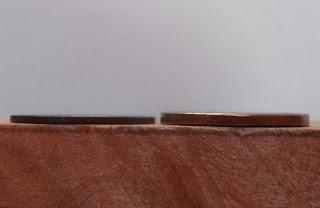 The primary evidence of planchet split after strike is thickness and weight. This coin is approximately one-half the thickness of a normal cent. Photo #3 shows this coin on the left and a normal cent on the right. This coin weighs approximately 1.5 grams vs. the standard of 2.5 grams for copper plated zinc cents and 3.1 grams for pre-1982 95% copper cents. 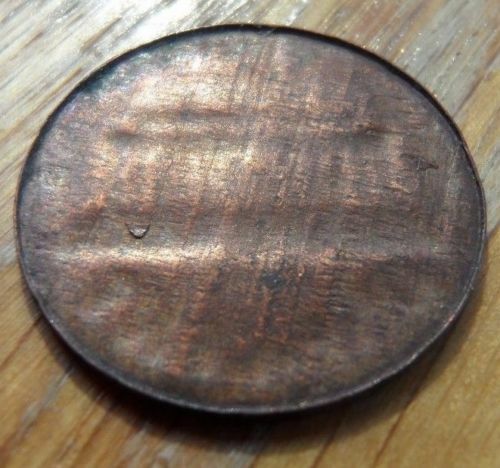 In summary, this coin originated as an internally flawed 95% copper planchet that was struck normally by both dies. The striking force fractured the coin which then split in half upon ejection from the press or at a subsequent process step. The exposed split surface shows no evidence of zinc material, so we may conclude that the original planchet was pre-1982 95% copper. The mating half of this coin is unaccounted for and we are left with a modern half-cent!